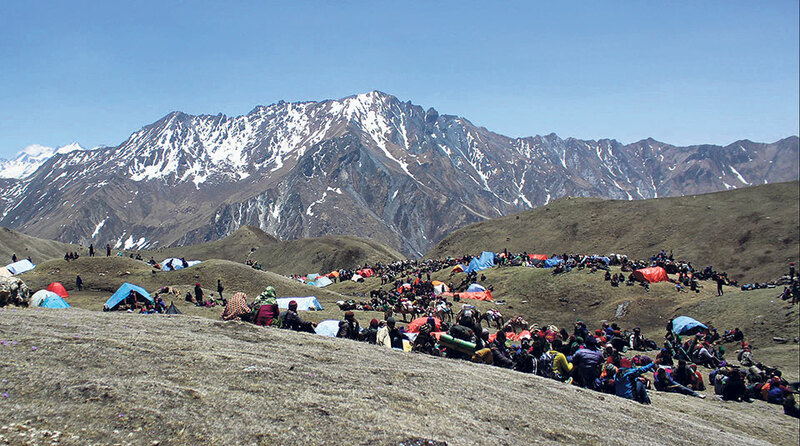 DOLPA, May 2: As the date for picking Yarsagumba nears in Dolpa, there have been multiple arrests of those intending to smuggle the prized herb, a caterpillar fungus known for its purported aphrodisiacal properties. On Monday night, security forces arrested 49 smugglers from Patan of Jagdulla Rural Municipality who reached there to pick Yarsagumba without permission. A joint team of Shey Phoksundo National Park and the security forces made the arrests. Two smugglers managed to flee while police were trying to arrest them. According to police, 11 of the arrested are women. Children are also in the group. All of them are from outside the district, according to conservation officer Ramdev Chaudhary. According to the national park, security has been tightened in various border points and places were Yarsagumba are found in abundance in order to stop smuggling. The season to pick Yarsagumba starts from July and continues for a month till August every year. A joint team from the national park and security agencies including Nepal Army has been formed for proper management of Yarsagumba collectors and to ensure their safety. Kagmara, Jagdulla, Majfalawan, Kunasha, Dopke, Bhancha, Thange, Namula, Choyala, Sagar, Basuda, Phulbari, Nawarpani, Chahara, Saikumari, Mate along with dozens of other places are the areas where collectors find Yarsagumba. Earlier on April 23, seven people who had reached Kagmara to pick Yarsagumba were arrested and sent to the national park's prison.